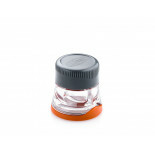 Waterproof cap and shaker module screws together to keep spices dry and flavorfull. 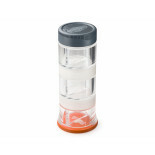 Twin compartment shaker includes single sided dispensing screen which twists into position and removes easily for cleaning. Convenient filler cap stores below the base and makes it easy to refill. 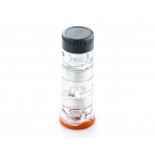 Clever modular design is infinitely expandable to carry any number of spices. Clear copolyester resin body is lightweight, clear and resilien. Three large, twin-chamber modules are watertight and screw onto each other to provide you with six independent flavor options. Countdown: Three, two, one.